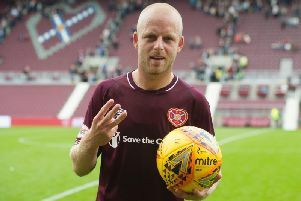 Hearts star Steven Naismith has admitted that he was “totally wrong” in the way he reacted to Celtic’s Jonny Hayes when the players clashed in a recent fixture. The Celtic winger fouled Naismith from behind, hitting his head against Mikael Lustig’s knee on the way down, during Hearts 1-0 win at Tynecastle earlier this month. The Scotland international reacted by shouting at the player as he lay prone on the ground. It was a reaction which prompted much discussion with Kris Commons calling it “disgusting” on Sky Sports. Speaking on BBC Sportsound, Naismith held his hands up but explained that he didn’t realise Hayes was so badly injured and that it was a “heat of the moment” reaction. He said: “To be honest, looking back on it, after when Jonny is down I had the red mist. It was a tackle that had come in, actually when I had done my first knee injury that was pretty similar. That was going through my head and I was totally wrong in my reaction. Naismith also clashed with Celtic captain Scott Brown. Last season the 31-year-old was handed a two-match band for a late challenge on the midfielder, a tackle which he said he “just slipped”. The pair escaped an SFA ban after the recent Hearts v Celtic fixture; Naismith for a kickout at Hayes and Brown for an elbow on Naismith. “I love playing against Broony,” he said, “he’s a battler and you know when he’s in your team he’s brilliant because he gets under the skin of the opponents and he drives you on and I know that from being in his team. “With Broony I was happy to take it. You give it out and you take it and that’s the way it was to be honest in the game, in the heat of the battle. I seen on TV one of the refs was saying there was no malice in it, it was more a reaction and that’s exactly what it was, me raging at the tackle, natural reaction ‘haw you’.